NEWTOWN, Conn. - Last year was an extraordinary one for firearm sales, a year unlike any other in the industry's history. That's a fact to be mindful of when comparing estimated sales through the first seven months of 2014 with those of the previous year, notes Steve Sanetti, President and CEO of the National Shooting Sports Foundation, the trade association for the firearms and ammunition industry. 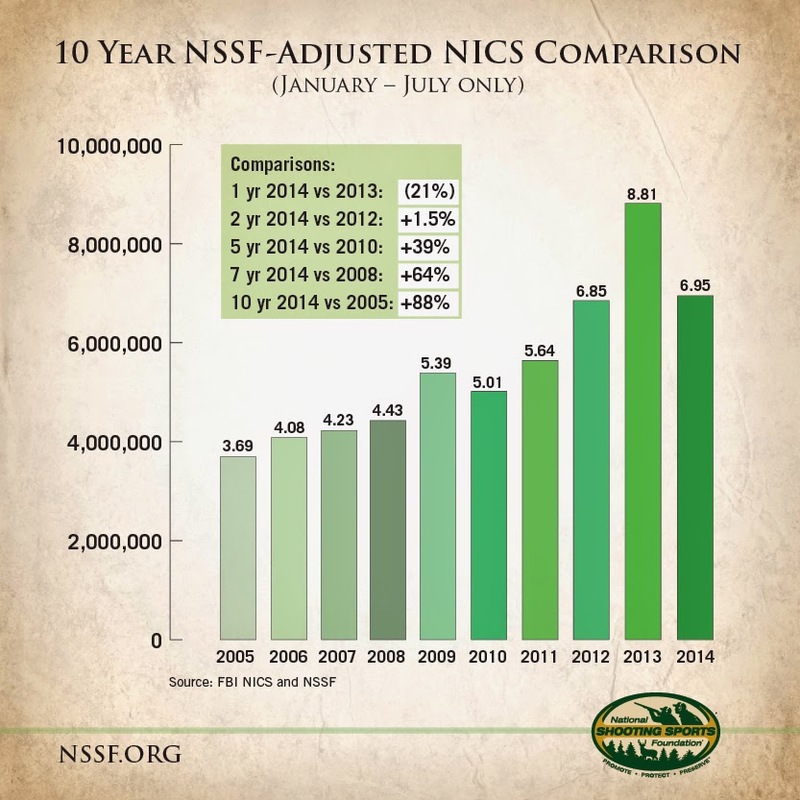 From January through July 2014, NSSF-adjusted NICS figures total 6.95 million background checks against 6.85 million for 2012 and 5.64 million in 2011. In 2013, the seven-month figure was 8.81 million and the annual total was a record 14.8 million. Multiple factors account for last year's sales surge, including a fear of additional firearms-ownership restrictions, which came to pass in states such as New York, Connecticut and Maryland, as well as increasing interest in owning firearms by women and former servicemen and women. "Those who are hostile to firearms ownership are trying to suggest sales are off in 2014 because people are no longer interested in owning guns, which is contradicted when you consider sales have risen for ten years, that last year was the highest year ever and that studies show increases in first-time gun owners and women buying guns," said NSSF President and CEO Steve Sanetti. "The sky certainly is not falling," Sanetti added. "To me, firearm sales data through the first seven months is saying our industry is experiencing a 'new normal.' Like a rocket ship, we've returned to Earth, but we haven't gone back in time. With 2014 on track to be one of the highest sales years in a decade, I call that a sign of a healthy industry serving a passionate, growing customer base." Sanetti said he's not surprised at the current sales market. "People in our business know it is hugely difficult to match a historic, unprecedented surge in customers buying all types of firearms," he said. He pointed out that during conversations last January with representatives of exhibiting firearms companies at the industry's annual trade show, the SHOT Show, hardly anyone was expecting sales to match the numbers those from 2013. "They were realistic in expecting and planning for a normalization," Sanetti said. The industry's most active sales months-October, November and December-lie ahead, a period when purchases are made for hunting season and holiday gifts. Said Sanetti, "Over the last decade, the market has spoken: Citizens around the country have exercised their constitutional right to purchase a great variety of firearms for target shooting, hunting and personal and home protection. I'm optimistic we'll see a strong finish to this year. And contrary to the naysayers, both the violent crime rate and fatal accidents with firearms have decreased about 19 percent and 22 percent during the past decade which saw these great increases in the number of firearms being purchased by more Americans. That's the most gratifying news of all."